Over the past 11 years, our annual Information Forum and Commemorative Luncheon have become a tradition! Our goals in planning the events are to bring the 9/11 community together in fellowship, to provide a wide range of informative programs that promote resiliency, and to commemorate the lives lost on 9/11. Thanks to the participation of so many, this year's agenda was exceptional! We want to share highlights of the events, especially for those of you who were unable to attend. 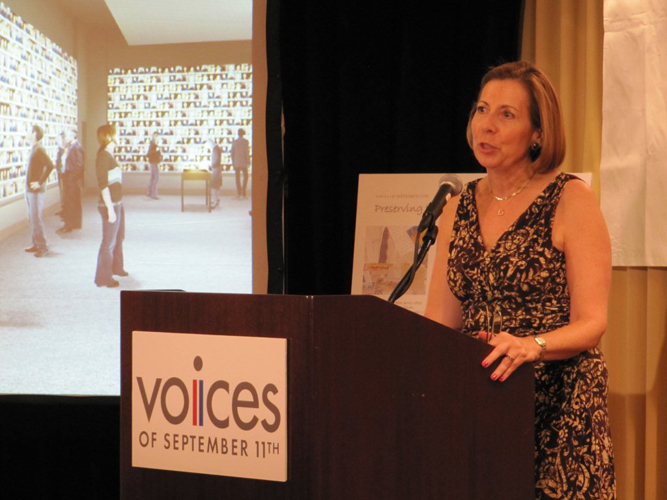 One of the special exhibits at this year's Forum focused on the 9/11 Memorial's planned exhibition: In Memoriam. The 9/11 Memorial offered a preview of two elements that will be featured in this exhibition dedicated to honoring the memory of the nearly 3,000 lives lost. 9/11 Memorial President Joe Daniels and 9/11 Memorial Museum Director Alice Greenwald spoke about the milestones the Museum has reached in collecting photographs and personal keepsakes, a process that has relied heavily on so much of the work we have done to create the 9/11 Living Memorial. Alice also talked about the plans for the Museum, saying, "We are building this Museum for future generations, but we're building this memorial exhibition to be true to all of you who lost your nearest and dearest, and if what we are doing meets your standards, then I know we are on the right track." To view Joe's and Alice's complete remarks, click here. During the press conference, the question arose about the delay in the construction of the Museum. We were delighted to hear at the end of the day that a settlement had been reached. Click here for the WABC News article on the settlement. 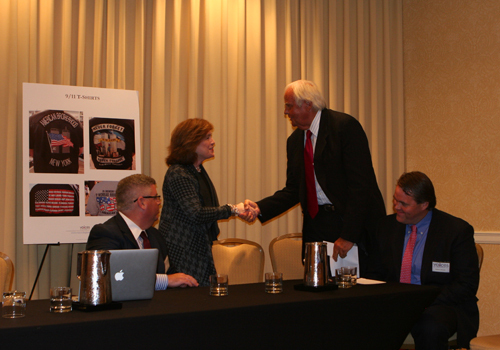 As in past years, our Annual Forum included panel discussions with subject matter experts that provided updates for 9/11 families, rescue and recovery workers and survivors. We are grateful to all our panelists who shared expertise about their advocacy efforts, the GITMO proceedings, implementation of the Zadroga Law, legal and financial issues, and how rescue workers and survivors can access medical and psychological services. It was a special honor to have Joseph Zadroga, father of rescue worker James Zadroga and John Feal, President of the FealGood Foundation in attendance. Later in the day details were announced on the expansion of the Zadroga Law. We have included articles in our "In the News" section below. It was fitting on the Eve of the 11th Anniversary to gather for an Interfaith Service at St. Peter's Church, a place where many rescue and recovery workers found solace after 9/11. Father Tyrrell graciously welcomed us and we were honored to have Secretary Napolitano join us and share an inspirational message of resilience. The moving ceremony concluded with the Sacred Heart University Choir singing a song that means a great deal to many of us, "God Bless America." To view the video, click here. 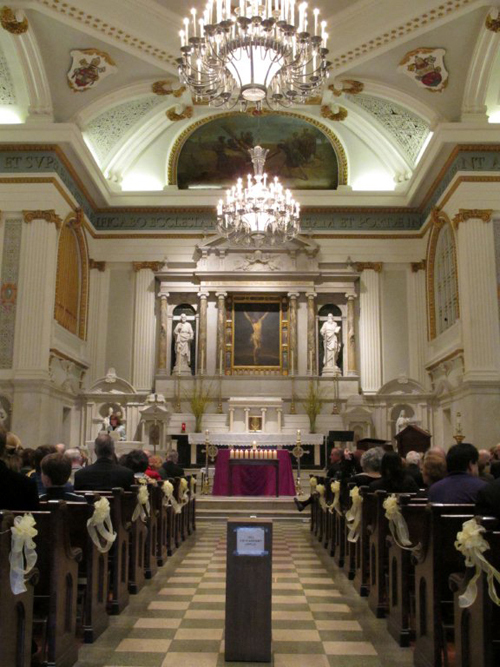 Other videos from the Information Forum and Interfaith Service can be found on our website. 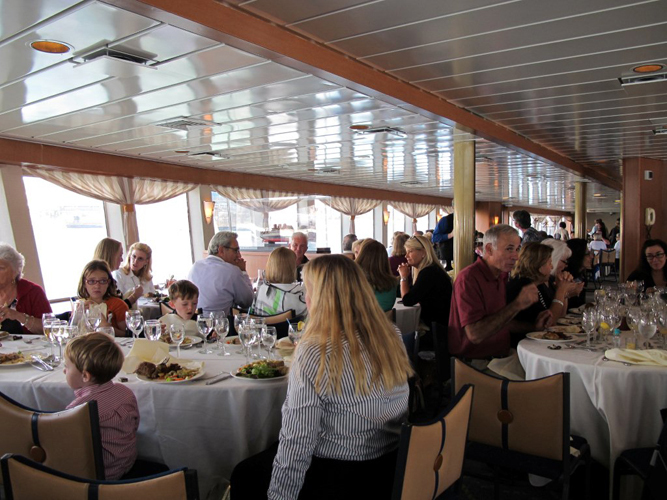 Following the reading of the names on September 11th, more that 200 family members joined us for a luncheon cruise on World Yacht Enterprises' "Princess." It was a beautiful day to cruise on the Hudson River and the members of the crew made sure that our afternoon was truly a memorable one. One family members told us, the cruise "made a very sad occasion into a happy one for us, where we were able to mingle and enjoy each others' company." To view photos of the cruise, click here. During our recent vacation, I had an opportunity to visit museums and churches, some built centuries ago. Their vision and commitment to documenting history caused me to reflect on the responsibility each of us have in preserving the stories of 9/11 for future generations. It also reinforced the importance of our work with the 9/11 Memorial in ensuring that our loved ones and the stories of 9/11 are remembered in a meaningful way. In closing, I want to thank all who contributed to making our anniversary events a success - our special guests, panelists, volunteers, interfaith leaders, musicians and vocalists. A special thanks to the World Yacht Enterprises for their hospitality in hosting our Commemorative Luncheon. Most importantly I want to thank our wonderful staff who worked tirelessly in planning and coordinating the events. Speaking on their behalf, it has been an honor and privilege to work with each of you. We are grateful for your friendship and look forward to our continued work together! Join the World Care's Center for a spectacular night as their star-studded panel of judges chooses the top chef in a head-to-head match-up between firehouse chefs and local restaurant chefs. The Iron Skillet Cook Off is held on October 22, 2012 from 6:00pm-9:00pm at Crimson Restaurant. Enjoy signature cocktails, Brooklyn Brewery craft beers, fabulous live auction prizes, and gourmet cuisine. 100% of the proceeds go to empowering local communities through disaster response training and support. For more information, click here. Each year on the fourth Saturday of October, millions of Americans take part in Make A Difference Day, the nation's largest day of volunteering. Click here to learn more about how you can participate in this year's Make A Difference Day on October 27th. First responders and New York lawmakers gathered at Ground Zero on Monday in an emotional appeal to Congress to safeguard funds for heroes sickened by 9/11. More. The families of people killed in the Sept. 11 attacks have been invited to military installations in four states to watch pretrial hearings in Guantanamo Bay, Cuba, for five men charged with planning or assisting the terrorist strike. More. The massive DNA database compiled after the World Trade Center terror attacks has linked 261 more body parts to its existing profile of victims since February, officials with the New York Medical Examiners office said Wednesday. More. A new documentary chronicling the post Sept. 11, 2011 development of Downtown will soon make its debut at Lincoln Center. "16 Acres," a 90-minute film delving into the political tensions surrounding the redevelopment of ground zero after the 2001 World Trade Center attacks, will premiere October 18 at the 2012 Architecture & Design Film Festival at the Allen Room in Lincoln Center. More. The lawyers defending 9/11 mastermind Khalid Sheikh Mohammed smell a rat - and it's not their client. The ground floor of a building used by the counselors at Guantanamo Bay, Cuba has been declared off-limits due to infestations of mold and rats that have been using the space as a latrine and dropping dead there for months, sickening the personnel. More. A New York federal judge who found Iran, the Taliban and al-Qaida culpable in the 2001 terrorist attacks has approved a $6 billion default judgment against them. More. More than 30,000 runners and walkers converged on the Red Hook section of Brooklyn on Sunday, lining up near the Brooklyn-Battery Tunnel. At 9:30 a.m. they were off, hurrying through the tunnel and then the side streets and quiet park walkways of Lower Manhattan in the 11th annual Tunnel to Towers Run, which has become one of New York City's biggest races. More. TIME has won an Emmy award for its groundbreaking website, "Beyond 9/11: Portraits of Resilience", in the category of "New Approaches to News and Documentary Programming." More.